This book presents the mathematics of finite dimensionalconstrained optimization problems. 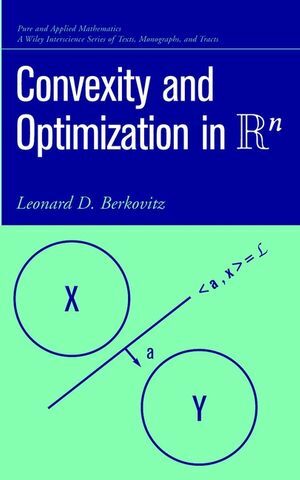 It provides a basis for thefurther mathematical study of convexity, of more generaloptimization problems, and of numerical algorithms for the solutionof finite dimensional optimization problems. For readers who do nothave the requisite background in real analysis, the author providesa chapter covering this material. The text features abundantexercises and problems designed to lead the reader to a fundamentalunderstanding of the material. A detailed bibliography is included for further study and an indexoffers quick reference. Suitable as a text for both graduate andundergraduate students in mathematics and engineering, thisaccessible text is written from extensively class-tested notes. LEONARD D. BERKOVITZ, PhD, is Professor of Mathematics at Purdue University. He previously worked at the RAND Corporation and has served on the editorial boards of several journals, including terms as Managing Editor of the SIAM Journal on Control and as a member of the Editorial Committee of Mathematical Reviews. 5. Systems of Linear Inequalities:Theorems of the Alternative. 5. First-Order Conditions for Differentiable NonlinearProgrammingProblems.